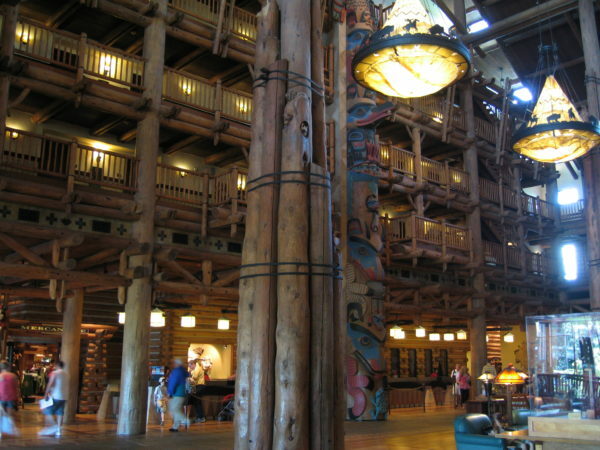 Disney’s Wilderness Lodge opened on May 28th, 1994 and since then has undergone two large renovation projects. It has stayed true to its original theme and has even earned some impressive awards. 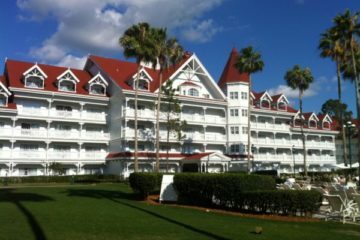 Let’s take a look at this very cool Disney World Resort Hotel! Disney’s Wilderness Lodge wasn’t part of the original plan of Disney World. 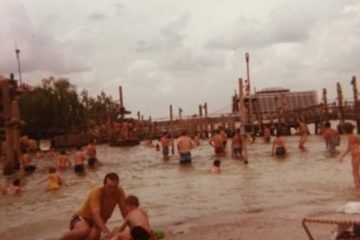 There were only three hotel options available to Disney World visitors in the early days of the resort: Disney’s Contemporary Resort, Disney’s Polynesian Resort, and Disney’s Fort Wilderness Resort and Campground. More resorts were planned, but when the Oil Crisis hit in 1973, then President Card Walker decided to build the Golf Resort and stop there since occupancy was down. Ideas for an Asian Resort, a Mediterranean Resort, and Cypress Point Lodge were all tabled. Around 1980, while Epcot was under construction, Disney knew they needed to expand the selection of Disney resort hotels. They had several ideas to choose from, but they decided to proceed with the Cypress Point Lodge idea mostly because it was enough removed from Magic Kingdom and not on the monorail line so construction wouldn’t disrupt the guest experience. Cypress Point Lodge would be a moderate resort hotel with 550 rooms and around 40 lakeshore cabins. There was no mention of this lodge in the original plans, but the land was cleared in 1971 photos. 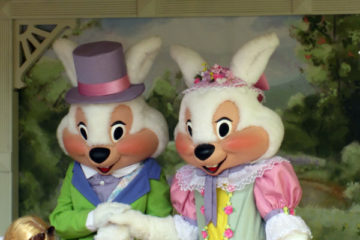 It first appeared in the 1980s in a large model of the post-show of Walt Disney Story attraction in Magic Kingdom. However, talk disappeared again in the late ’80s when the drastically over-budget EPCOT Center took all available funds. Finally, Disney’s Wilderness Lodge was announced in the late ’80s, and design began in 1989. Eisner hired The Urban Design Group, which included an outdoors-man, a fisherman, and someone who had extensive knowledge of the west. 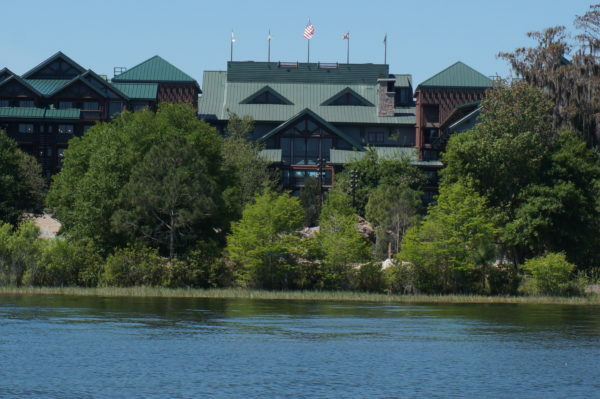 They broke ground in August 1992, and just two years later, with no construction delays due to good working relations between Disney, the Imagineers, and the contractors, Disney’s Wilderness Lodge welcomed her first guests! Just four years after it opened, Disney announced that the Disney Vacation Club would build villas on site. The inspiration for the villas was the early railroad hotels of the 19th century. Imagineers used a different color palette of red and gray to reflect the theme but also set them apart from the lodge since they were to have been built before the lodge in the storyline of the resort. The Boulder Ridge Villas, as they are named, have studio, and two-bedroom units to accommodate just a few people or a whole family in a large kitchen and living space. The villas opened in 2000 then another expansion came in 2015 when Copper Creek Villas and Cabins were announced. This renovation opened in 2017 and brought waterside units, more recreation, and more dining opportunities. Disney’s Wilderness Lodge is located in the Magic Kingdom Resort. 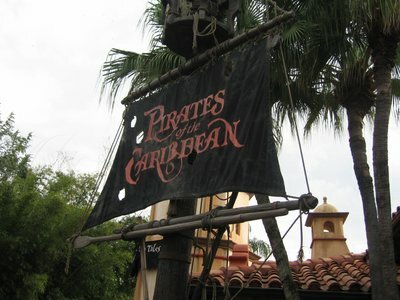 There is boat transportation between Magic Kingdom, Disney’s Contemporary Resort Hotel, and Disney’s Fort Wilderness Resort Hotel and Campground. Buses will take you everywhere else you need to go. This location also means that you have a prime viewing spot for the Electrical Water Pageant, which passes by around 9:30 every night! 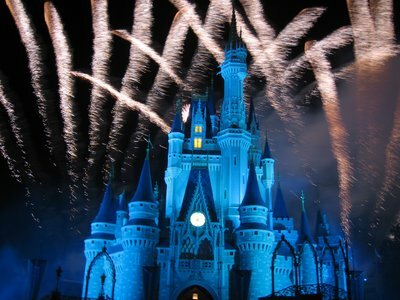 You can also see Happily Ever After Fireworks right from your resort. When it comes to the resort, there’s lots to do as well. There are two pools, one of which has a waterslide and a play area for the kids, hot and cold whirlpools, bike and boat rentals, catch and release fishing, jogging trails nestled beneath the trees, movies under the stars every night, an arcade, campfire activities, and a full-service health club called Sturdy Branches that even offers a sauna, massages, and facials. That sounds like a lot to do, but probably the best thing you can do at Wilderness Lodge is walk around and take in the amazing theming. As the main building, which was inspired by the Old Faithful Inn, was being built, Michael Eisner spared no expense. He insisted that the hotel have a lakeside setting even though it was built on wetlands. He also hired a special architectural team whom he sent around the country to do lots of research. They, together with his Imagineers, visited all of the great hotels of America’s national park system including Yellowstone, Glacier, and Yosemite. As I mentioned above, the primary inspiration came from these parks and specifically from Old Faithful Inn, which was formerly known as Ahwahnee Hotel, in Yellowstone National Park. From design to construction, Eisner was personally involved in every decision. He encouraged his team to think outside of the box as part of his “Disney Decade” to make Disney the absolute best it could be and really make it more relevant not only to the here and now but also to the future of Disney. He wanted staying power in hotels and attractions. Eisner believed that architecture was part of the show – bringing the theme and the storytelling together – that has been at the heart of Disney since the beginning. It was what Walt wanted, and Eisner insisted on continuing his legacy. As such, everything about Disney’s Wilderness Lodge fit the theme of being a western lakeside resort in the continental US. Fortunately, Disney had resources beyond what the Urban Design Group was used to because it’s not easy to build this kind of construction on wetlands in Florida. 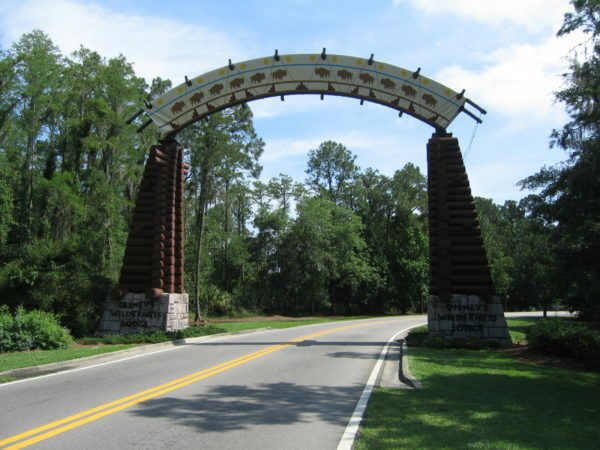 You’ll know you’re getting close to the Wilderness Lodge when you see this archway on Timberline Drive! To enhance the theming, the team decided to build a long entry road, which they named Timberline Drive. It’s just off of World Drive, a main throughway in Disney World. As soon as you turn onto the road, you pass under an archway. Now, you’re leaving Florida! After a relatively long drive, you approach the lodge from the side to make it feel like you’re arriving at a remote location. Wilderness Lodge gives the illusion that you are in a remote hunting lodge. In fact, you’re very close to lots of things! 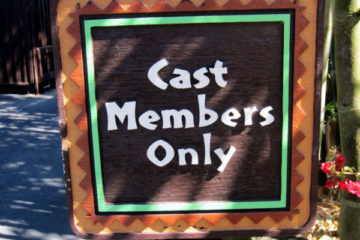 Another part of proper theming is to select plants and shrubs that match the setting. These natural elements must fit the story of the Pacific Northwest but also survive in the sometimes harsh Florida climate. All of this theming is part of the show, and Disney’s Wilderness Lodge is architectural storytelling at its finest. As you step inside the massive six-story lobby, you’ll immediately notice that it is made of all wood reminiscent of an old timber lodge. Once you take a good look around, start to notice the details. The floor is a Hopi storm pattern with lightening bolts extending out from the storm to the four corners of the earth. The floor is made of all wood (Brazilian cherry, white oak, bird’s eye maple and burl walnut wood), though it looks like a rug, lending itself to all natural colors. The floor may look like a rug, but it’s actually made of wood! Also, look how beautiful the lodge is at Christmastime! The light fixtures are teepees. Each of the four chandeliers weighs 600 pounds each and are made from real rawhide. They’re hand painted with Native American Symbols, and there’s a wrought iron ring going around the outside. Eisner insisted that the whole lobby be lit by just these four chandeliers, so they were specially designed to do just that. These chandeliers are quite impressive! The fireplace is 82 feet tall and made of fabricated stone so as not to damage the natural stone that it replicates in the Grand Canyon. A paleontologist came in to verify that the strata was representative of the real thing and place actual fossils in the correct strata. The support piers are made of bundled railroad ties inspired by the Columbia River. They represent the four corners of the earth, which also compliments the storm pattern on the floor. These bundled railroad ties were inspired by the Columbia River and compliment the storm pattern on the floor. 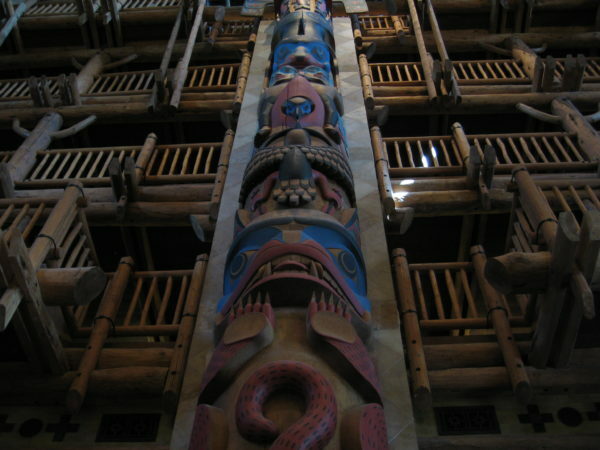 On either end of the lobby stands two 55-foot tall hand-carved totem poles each made from one hundred year-old red cedars. They’re three-feet wide at the top and five-feet wide at the bottom, but they’re hollow the whole way up. The designers had to hollow them out to preserve them. Disney Imagineers didn’t harm any live trees in making these totem poles. They were made from standing trees in Montana that had already died. These huge totem poles are hand-carved and hand-painted! Then there’s the hot springs. Head to the back of the lobby where you’ll find a spring bubbling out of the ground. It was inspired by the Metolius Springs in Central Oregon’s Deschutes National Forest. The re-creation in Wilderness Lodge starts in the lobby and flows outside through the courtyard into the pool, down to Fire Rock Geyser, and into Bay Lake, which is reminiscent of how Metolius River flows. 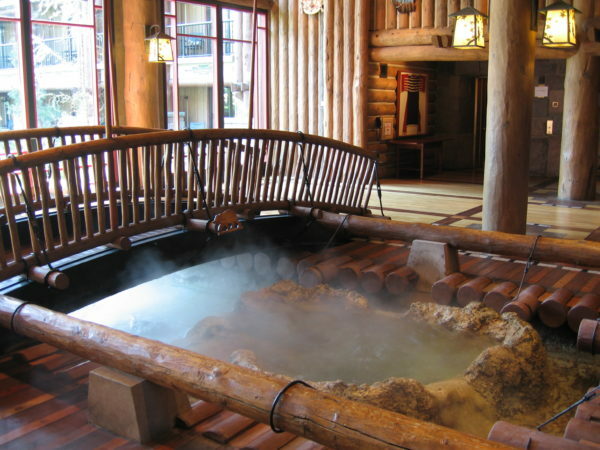 Continuing the Lodge’s authenticity, the hot springs was inspired by the Metolious River! The entire lodge is authentic and detailed. You might be able to guess that all of these details actually sent the whole project way over budget, but Eisner approved all of it. He knew that the resort had to be viewed as legitimate or it wouldn’t succeed. 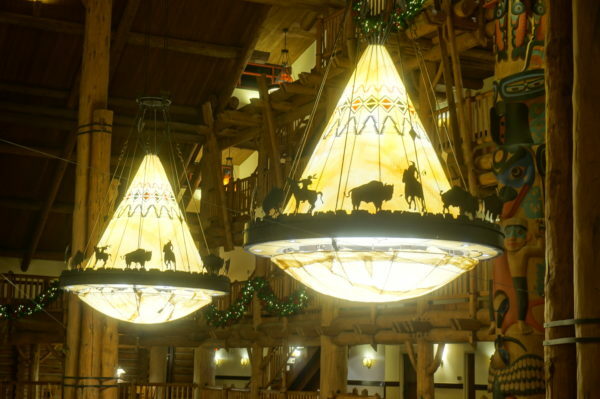 As with every attraction in Disney World, Disney’s Wilderness Lodge has a backstory. Sometimes these stories are real, sometimes they’re totally made up, and sometimes they’re somewhere in between. The Lodge is art reflecting life, but it is not based on actual events. Regardless, it is interesting, and Disney worked very hard, especially in the early days, to convey this backstory to guests. In the early days of the resort, upon check-in, early guests were given a newspaper called The Silver Creek Star, Vol. B / No. 28,298. This newspaper gave information about guest services, and it mixed in the story of the lodge. Colonel Ezekiel Moreland trekked across the wilderness selling furs, and he amassed great wealth doing so. Because of this, he was able to hire a crew of men to build a small lodge near a fresh-water spring for him, his daughter, Genevieve (Jenny), and her traveling companion, Austrian artist Frederick Alonzo Gustaf. They welcomed artists, scientists, and nature lovers from all around, and soon they were out of room, so they had to expand making the spring part of the lodge. Gustaf, being an adventurous artist, set up his easel on a rock ledge to get the best views of the valley As he began to paint, the ground trembled and gave way. This is how they discovered the geyser, which they named Fire Rock Geyser and is themed after Old Faithful. It erupts every hour on the hour from 7am to 10pm. Once the lodge was finished, the owners added a formal dining room aptly named Artist Point since many more adventurous artists attempted to follow in Gustaf’s footsteps. This restaurant provides some incredible views of Bay Lake, Copper Creek Falls, and the resort as a whole. However, the geyser apparently dates back long before Gustaf’s experience. One time, a Native American visited the lodge and told Moreland about his experience with the geyser. During one especially bad winter, excessive snow trapped an Indian hunting party in the valley. To keep warm they built a fire, but after five days of keeping the fire burning, the ground beneath them cracked and rocked erupting a geyser. The Indian told Moreland that they had angered the earth with their wasteful use of fire, and the geyser is Earth’s way of retaliating. The lodge today still fits the original theming, but it also meets the expectations of the modern guest. This is reflected in the awards given to the Lodge. 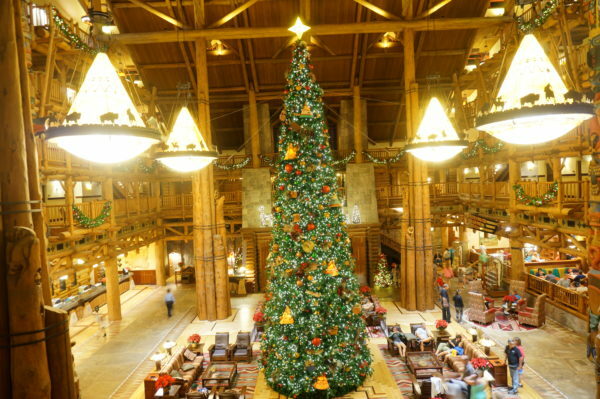 First, Disney’s Wilderness Lodge is a AAA Four Diamond Award Hotel, which includes just the top six percent of hotels. It is also recognized in the Florida Green Lodging Program. The resort first received this designation in November 2007 because it meets the standards of environmental responsibility (a national requirement) and continues to conserve natural resources, reduce waste, and minimize pollution (a Florida state requirement). What’s more, the Lodge must maintain certain standards including completing a minimum set of best management practices in communication, water conservation, energy efficiency, waste reduction, and clean air. The program also requires that the resort continue improvement in these areas to retain the designation and use it in their marketing strategies. Disney’s Wilderness Lodge is truly one of the most unique places you can stay in Disney World! Are you a fan of Disney’s Wilderness Lodge?